Cloud Computing and Virtualization made it possible to operate branch offices without the need of local IT infrastructure, decreasing the cost and consolidating business. Actually we wrote the whole thing, from Virtualization point of view as multi part article – Benefits of Desktop Virtualization for Businesses. Cloud Computing and Virtualization are not the same, there are differences between Cloud Computing and Virtualization. Companies with branch offices, for efficiency reasons, should try to consolidate their distributed IT infrastructure. The focus is on aspects such as server and storage virtualization and optimizing the network. The ultimate result is decrease in cost. Again, Cloud Computing and Virtualization must not be equated as equal terminologies. Like we have written in details in the previous article on Desktop Virtualization (linked above), with Desktop Virtualization with own datacenter; there is no need to outsource anything. There are still IT infrastructures those are opposing to all the consolidation tests. Here the challenges get exposed by the fact : increasing the cost only results to a greater efficiency. One possible solution would be to centralize Storage and Server to the branch and no longer locally held and the network needs to be optimized to handle the higher traffic. 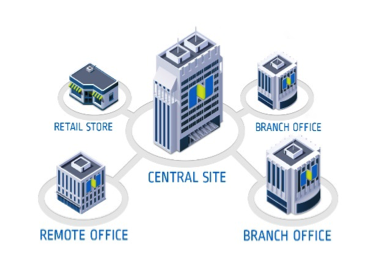 Previously, one had branch offices for company for the rapid processing of large amounts of data at the branch office level using the storage and server vicinity of the user. Only in this way it was possible to ensure the required availability and performance. Particularly with regard to data security there are big risks.Obviously, if important information is stored outside of the central data center it increases the risk. Their safety can therefore not be guaranteed, which is also the observance of compliance requirements. Last but not the least, an external infrastructure, decreases additional costs, since each must be physically purchased hardware on site need not to be and serviced and managed – here is where we use Cloud Computing, judiciously, only in need. A new architectural approach is the Virtual Desktop Infrastructure (VDI). Such an approach with a focus on Storage Delivery is dedicated to the virtualization of servers and storage in the branch office and has to reduce the target costs, improve security and comply with arrangements to increase flexibility and productivity. The IT department, this concept offers the possibility to consolidate and manage all branch servers in the data center. While the data thus safely provided within the central data center, repaired, expanded and can also be protected, they are available to users at the same spot with full performance. By consolidating the IT infrastructure in remote locations, companies can centralize their server applications and data at full and at the same time allow locally productive work. Valuable corporate resources are widely distributed and thus high security risks can be exposed, get back them under the direct control of the IT department, also it decreases the spending for the support and management for the branch offices. Because the servers and data management in happening the data center, on site requires no IT staff anymore or no one needed to be sent for repair there. With the central storage of data from the branches in the data center, the IT department can also use the same standardized policies and procedures for all company data. Thus, specific backup solutions can be purchased, installed and managed. Overall, with this concept, the total operating costs can be reduced by 20 to 50 percent, compared to other processes for the management of an IT infrastructure at remote sites. This Article Has Been Shared 1368 Times! Cite this article as: Abhishek Ghosh, "Cloud and Virtualization : Operate Branch Offices without Local IT Infrastructure," in The Customize Windows, December 31, 2013, April 21, 2019, https://thecustomizewindows.com/2013/12/cloud-and-virtualization-operate-branch-offices-without-local-it-infrastructure/.